While bemoaning his struggles with translating the Middle English poem “Pearl,” Tolkien declared to his aunt, Jane Neave, that ‘a translator is not free”: but he neglected to delineate the specific rules by which he believed translators were shackled. 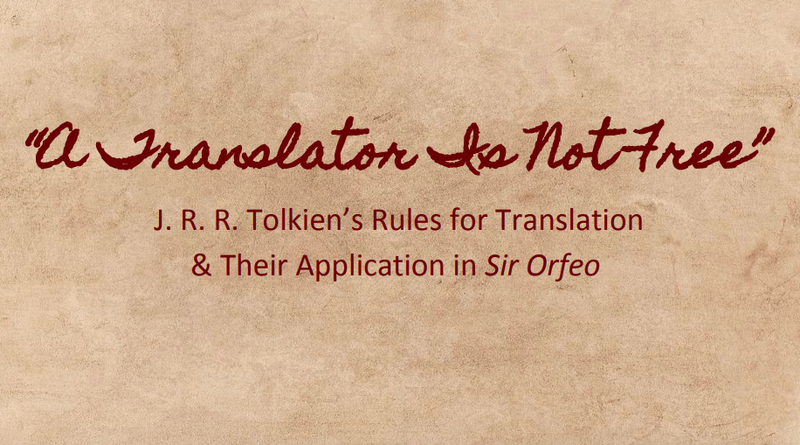 Fortunately, elsewhere in his writings, Tolkien provides hints and directives on how to approach translating. This paper collects Tolkien’s translation guidelines from across several of his works, and it describes how he applied them in his own translations, using his posthumously published translation of Sir Orfeo as a basis for demonstration, particularly in comparison to the Auchinleck manuscript version as published by Kenneth Sisam (for which Tolkien provided a glossary) and the Middle English edition Tolkien prepared for his 1944 naval cadets’ course on the poem.